Lack of enough snow, rising temperatures, new destination: Forrest, hamlets, and great panoramic view: on the slopes of upper Leventina, and this time, the Northern side. (last year, Nante on the Southern side). There will be a shorter version, if you wish. 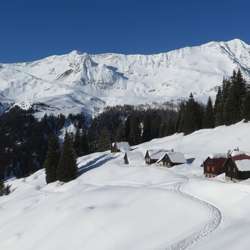 The shorter version will also mainly consist of snow-covered forest roads, with a good chance that snowmobiles have already done the job to pack the snow, which will make walking a bit easier. Longer version will most likely take us through some virgin snow. We will meet in Quinto, then drive up about 8.5 km (very few curves), to Brugnasco, put on the snowshoes, and...hit the snow! Campoi, Morinàl, Rütan, Ce di Fuori and Monte di Vento, are some of the nice "Baite" we will pass through. WT2 (on a scale from 1 to 5) Longer version might include a few small sections, that due to narrow passage and a few steep downhill sections are considered WT3. Longer version: There are a few possibilities. We will evaluate on the spot, depending on snow conditions. Distance: up to 9 km.